SANDRA TAYLOR AGENCY – 2014 WINNER OF "BEST BEVERLY HILLS AGENCY"
Sandra Taylor Agency, a professional domestic agency based in Los Angeles and one of the first of its kind, was awarded the coveted Best of Beverly Hills Award for the year 2014. The agency offers experienced and highly screened nannies, housekeepers, personal chefs, senior companions, and baby nurses as well as all types of domestic help. 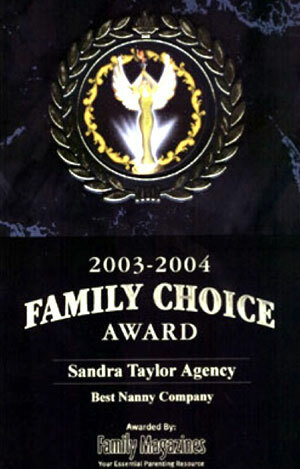 The household staffing agency received the honorary achievement on October 21, 2014, in Beverly Hills, where it was declared that Sandra Taylor Agency was awarded in the category of Employment Agencies. It was provided by the Beverly Hills Award Program and the company has received the title seven times in a row, including this year. The Beverly Hills Award Program offers this appreciation to only a few service providers for their reliability, quality, and ability to deliver the best in value. Each year, the award goes to some deserving service provider in the Beverly Hills area that excels in the quality of service they provide to the community. 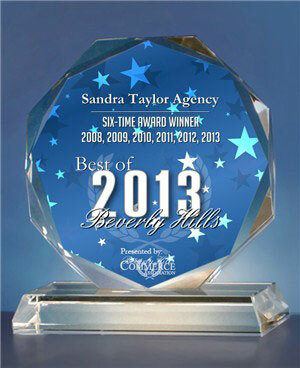 Sandra Taylor Agency was chosen this year’s most loved and trusted agency in Beverly Hills. New award for 2013 - SANDRA TAYLOR AGENCY - RECOGNIZED BY THE U.S. COMMERCE ASSOCIATION AS "BEST BEVERLY HILLS AGENCY" SIX YEARS IN A ROW. We were voted BEST NANNY COMPANY by the selective readership of the authoritative Family Magazine for the city of Los Angeles. The Family Magazine Group is considered the region's premiere parenting resource for family-related events, entertainment, and feature news articles.